The woman depicted is Ariko no Naishi, a lady-in-waiting at the Heian court, who is about to commit suicide because of her unrequited love for Senior Councillor Tokudaiji no Sanesada. Her story was made into the nō play 'Ariko no Naishi'. 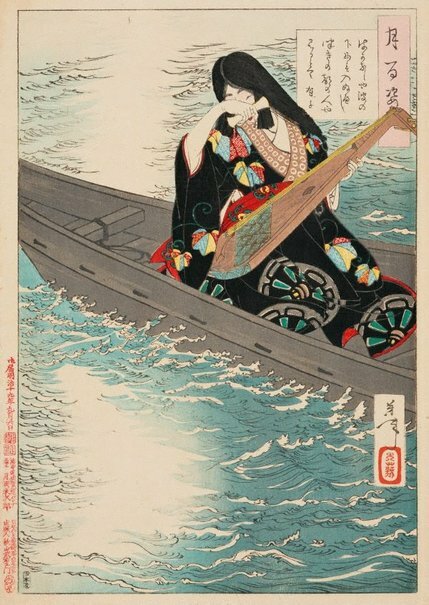 ‘Moon Capital’, mentioned in the title of the poem that Ariko recited before jumping from the boat, was a poetic name for Kyoto, the imperial capital. Natalie Seiz, Look , 'Lunar orbit', pgs.24-28, Sydney, Aug 2016, 27 (colour illus. ).